Going away on vacation is always amazing, but I am a huge fan of staycations, which is how the boys and I have spent our week. I can’t believe how quickly the time goes when we take it just a little easier and do a little exploring. If we had time, there are so many other places I would like to visit in Baltimore—how have I still not seen George Washington’s teeth?—but maybe we can still fit those in later this summer. I am grateful for this time with our boys, especially while they are young enough to enjoy being with me but old enough to go to the public restroom alone. We’ve visited the library and had a couple great play dates and spent maybe a little more money than we should have. 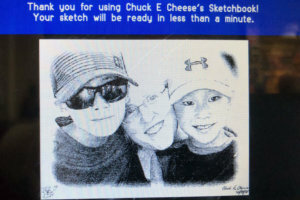 And we went to Chuck E. Cheese. Because…you know. Summer. It’s just a magical time. Next staycation maybe I’ll actually invest in one of these Harbor Passes, and we can check out some of the history and fun in our own city of Baltimore. Does anyone know whether the Babe Ruth Birthplace is child-friendly? Do they have an interactive exhibit where a child can call his shot and slam a home run to that precise part of the park? 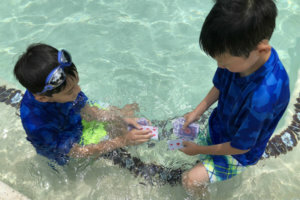 Our boys enjoy card games, and summer is a perfect time for that. The other night I taught them “Spit,” and it took me back to middle school when I felt I was practically a professional-caliber Spit player. But of course, our rising fifth grader soundly beat me on my first game in quite a few years. A few months ago he had spotted a pack of waterproof playing cards, and we just had to buy them. When a friend invited us to visit her grandparents’ pool this week, they were so excited to try out their waterproof cards. I’m happy to report that they are, in fact, waterproof, and that we haven’t lost a single card…yet. If we still have all 52, I can’t wait to watch our boys play cards on the beach later this summer and not worry about how wet they get. How’s summer reading going at your house? We are offering our sons “Buettner Bucks” this year. They can earn them for reading and writing and they will be able to trade them in for actual money. It’s a small amount, but it’s something, and the boys are excited. We have started the summer strong with good reading and some amazing writing, including a couple short stories. 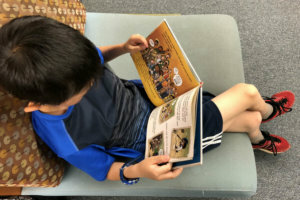 Money can’t buy happiness, but it might be able to buy us some extra reading and writing time this summer—or make it seem just a little more fun for our children. Works for me. We are having friends over for dinner, and I have been running around straightening up and cleaning. It occurs to me that we should entertain more often since that’s the only time I really do any cleaning. Our little guy has now received his seventh Holy Communion—but who’s counting?—but I love getting a formal First Communion photo afterward when the crowds are gone and the pressure is off. So Daniel dressed up again, and my friend John from Coyle Studios came out and photographed him in front of our church. Daniel had his own creative ideas about how he should hold his missal and rosary and where he should stand. 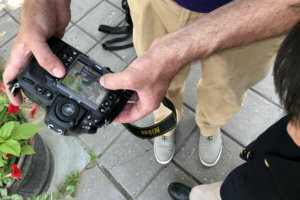 I can’t wait to see the photos, especially since I got a sneak peek at some of them on the camera. Today is my Grandma Rose’s birthday. If she were alive today, she would be 105. I love remembering her. I love telling my children about her. I love that I still feel connected to her even though she passed away seven years ago. Have you seen the movie Coco? It’s on Netflix, so we watched it this week. Halfway through, our younger son (who had already seen it) slipped outside to catch fireflies, and my husband went with him because it was dark. When they came back, the movie was nearing the end, and I was sitting with tears running down my cheeks, overcome with emotion and beauty and the joy of knowing that we never really lose our loved ones. I always assume I am the last to see a movie, but if you haven’t seen it, you should. I have been trying not to spend much money on treats for our sons this week, but I’ve been failing. When we went to the Shrine of St. Anthony, I let them each pick something out in the gift shop. When we found ourselves in a bookstore later that day, I couldn’t resist letting them each get a book. And when we stopped at Ollie’s yesterday to stretch our legs, Leo found an airplane-building kit. I am a sucker for a good craft kit, and he knows it. 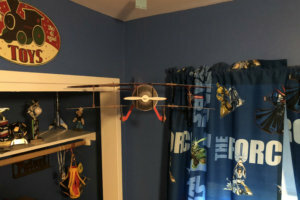 But this cardboard plane he made is now hanging in their bedroom. Will it last forever? Unlikely. But it has already lasted longer than the huge Slurpees we bought at the 7-11.